Despite the growing population of young people—1.2 billion of the world's population is now aged 15 to 24—young people are often excluded from (decent and paid) work and decision-making about employment. Young people in the rural areas of Ethiopia, Bangladesh, Pakistan and Indonesia all face similar challenges. Lack of economic opportunities, worsened by the impact of climate change and weak governance, drives them into already overcrowded and stressed urban centres. This threatens the future viability of rural areas, and food security. Young people must be ready for work, they need to be confident and skilful, and be part of social networks to find or create jobs. They must have the capacity to negotiate with key stakeholders to change the rural labour market and related education sector to be fit for the future. This can be achieved through improving local education services; forming and working with youth groups on skill-building; and working with the private sector and government to create apprenticeship, internship programmes as well as on-the-job training opportunities. 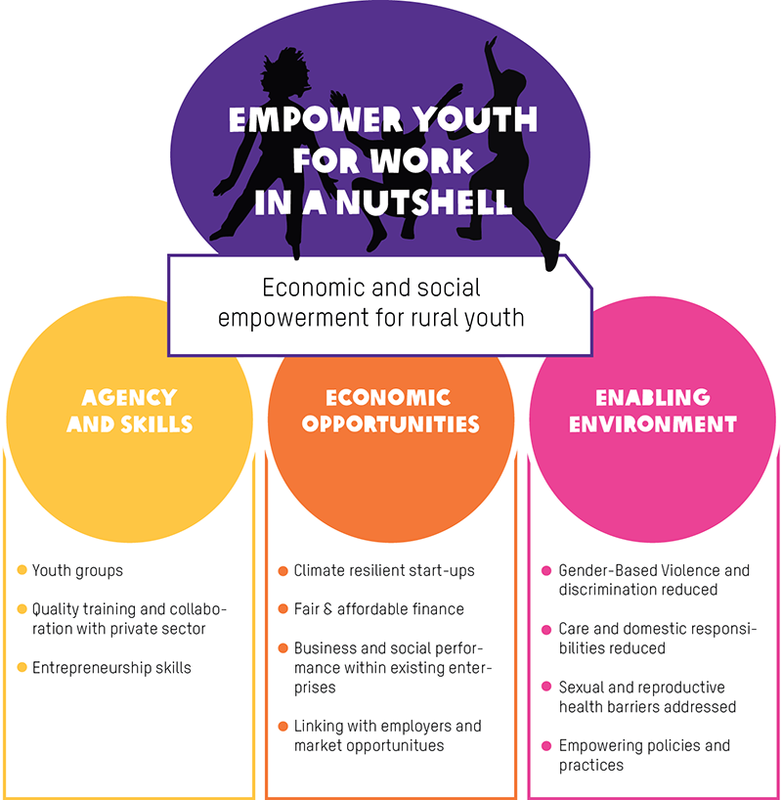 There must be decent, youth-friendly and gender-equitable jobs and entrepreneurship opportunities. Economic opportunities need to reduce the impacts of climate change, be adaptable to change and promote social sustainability. This can be achieved through promoting the establishment of new climate-resilient micro enterprises; improving business and social performances within existing micro, small and medium-sized companies; increasing access to finance for entrepreneurs and established businesses to grow and expand. We will work with the government and the private sector so businesses have improved standards on fair wages, social security, childcare, and work place anti-harassment policies. Most importantly, we will focus on linking young people to employment opportunities and to new entrepreneurs through online and offline job boards. Society must allow youth to work, innovate, use and create opportunities by fostering an enabling environment in which they can thrive and have their voices heard. This can be achieved through a variety of lobby and advocacy campaigns working and targeting communities, government, religious leaders and businesses. Activities range from street theatre, large-scale mobile phone messages to addressing community and government leaders, and youth groups working within their community, and much more. an enabling social environment is created through grassroots and mass media action, and that climate change, resilience, gender and youth empowerment are mainstreamed. Furthermore, 70% of the beneficiaries are rural young women. Within the next 5 years, we aim to successfully reach and really empower 184,964 young people to work in Pakistan, Bangladesh, Indonesia and Ethiopia.